Twelve years ago, Dr. Michael Behe burst onto the scene with his 300-page challenge to organic evolution, titled Darwin’s Black Box. Behe effectively argued that “systems of horrendous, irreducible complexity inhabit the cell” (1996, p. 252). Such complexity, he concluded, demands a designer: “...[L]ife was designed by an intelligence...” (p. 252, emp. added). Behe became a champion of the Intelligent Design (ID) movement, even testifying as a primary witness for the defense in the Kitzmiller v. Dover Area School District federal court case on intelligent design (see Kitzmiller v. Dover..., 2005). Although in Darwin’s Black Box, Behe confessed that he had “no reason to doubt that the universe is billions of years old,” and that he had “no particular reason to doubt” common descent (p. 5), such comments were few and far between. Some Bible-believing scientists, trying to give Behe the benefit of the doubt, speculated that, perhaps such “brief, sporadic comments...were intended to make the book more marketable” (see Major, 1996). (It was, after all, made available by a major publishing company—Simon & Schuster.) What’s more, “Behe’s arguments stand without any reference to the age issue” (Major). Christians have much less about which to be excited in Behe’s latest book, The Edge of Evolution. Sadly, it is riddled with unscriptural, unprovable, even irreverent statements. First, Behe repeatedly gives credence to the evolutionary geologic timetable. He writes about fish that he believes have been around for “ten million years” (2007, p. 16), and how “perhaps a trillion creatures have preceded us [humans—EL] in the past ten million years” (p. 60). Behe even goes so far as to suggest that life has been on Earth for “the past several billion years” (p. 19). The fact is, Behe’s thoughts contradict holy writ: God created “the heavens and the earth, the sea, and all that is in them” in six days (Exodus 20:11)—thousands, not billions, of years ago (cf. Mark 10:6; Luke 11:49-51; Romans 1:20; see also Lyons, 2006). “Evolution from a common ancestor, via DNA changes, is very well supported” (p. 12). “[O]ne leg of Darwin’s theory—common descent—is correct” (p. 65). “The bottom line is this: Common descent is true” (p. 72). “Despite some remaining puzzles, there’s no reason to doubt that Darwin had this point right, that all creatures on earth are biological relatives” (p. 72, emp. added). Even humans and chimps? Does Behe really believe that ape-like creatures evolved into humans over millions of years? Unfortunately, he does. On page 60, he writes: “For the past ten million years the population of the line of primates leading to humans is thought at best to have been roughly about a million or so” (emp. added). Why some Christians will interview Behe about his new book, seemingly recommending it, yet not warn people about the dangerous error found therein, is also unfortunate. Still, perhaps most troublesome are Behe’s statements regarding “When Bad Things Happen to Good People” (pp. 237-239). Behe chooses briefly to address the “designer.” He asks: “What sort of ‘fine-tuning’ leads to untold human misery? To countless mothers mourning countless children? Did a hateful, malign being make intelligent life in order to torture it? One who relishes cries of pain?” (p. 237). His answer: “Maybe. Maybe not.... [W]hether the designer of life was a dope, a demon, or a deity—that’s a topic on which opinions over the millennia have differed considerably. Each argument has some merit.... Maybe the designer isn’t all that beneficent or omnipotent” (pp. 237-239). Some Christians might excuse Behe, believing that he was merely thinking out loud, or just trying to get his readers to think. Regardless, such jargon is rubbish. It is repugnant to insinuate that God relishes the cries of the innocent, or to list Deity next to dopes and demons as the possible designer of life. To suggest that God “isn’t all that beneficent or omnipotent” is gross irreverence. All Christians can appreciate Behe’s work in the field of biochemistry, which testifies to the intelligent design of a cell (even though he failed to draw the only warranted conclusion, i.e., the God of the Bible is the Creator). In Behe’s latest book, however, his assertions about a billion-year-old Earth, the evolution of primates to man, and a possible uncaring Designer, are appalling and unscriptural. Christians be warned: the poster child of the Intelligent Design movement is no Bible-believer. 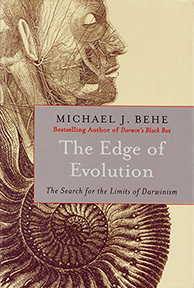 Behe, Michael (1996), Darwin’s Black Box (New York: Simon and Schuster). Kitzmiller, Tammy, et al. v. Dover Area School District, et al. (2005), United States District Court for the Middle District of Pennsylvania, Case No. 04cv2688, [On-line], URL: http://www.pamd.uscourts.gov/kitzmiller/kitzmiller_342.pdf. Lyons, Eric (2006), “Man Has Been on Earth Since...,” [On-line], URL: http://apologeticspress.org/articles/3068. Major, Trevor (1996), “The Design’s in the Details,” [On-line], URL: http://apologeticspress.org/articles/2459. Snoke, David (2006), A Biblical Case for an Old Earth (Grand Rapids, MI: Baker).